Can fast food be good for you? 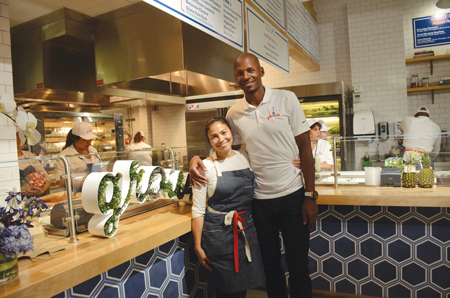 At Grown restaurant the answer is a resounding “yes.” NBA superstar Ray Allen and his wife Shannon are succeeding in their mission to provide delicious, nutritious, and locally sourced organic food at affordable prices with the speed of national fast food chains. 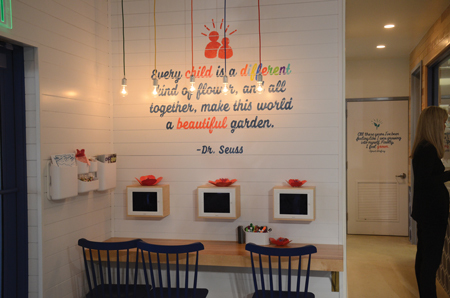 Ray and Shannon’s concept for the eatery arose from their belief in the benefits of consuming non-processed food and in the realities of managing the dietary requirements necessitated by their son’s diabetes. 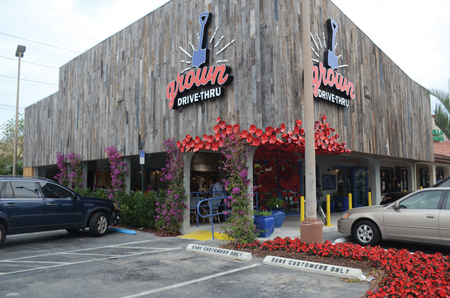 Grown is a drive-in, dine-in, and takeout restaurant in a beautifully-appointed, open kitchen setting just off US 1 and SW 67 Avenue (Ludlam Road). Opened in March 2016, Ray and Shannon plan to “grow” Grown from their flagship on the border of South Miami to other locations throughout the country. Sourcing suppliers of organic food is, according to Shannon, hard work. She relies on 10 vendors: purveyors of grass-fed USDA beef, United Natural Foods Inc., the Garden Network, and local Homestead companies such as Patch Gardens, Mr. Green Dean, Verde Community Farms, Health & Happiness Farms, Paradise Farms, Bee Heaven, and Possum Trot Farm (all located within 15 to 25 miles of Grown). 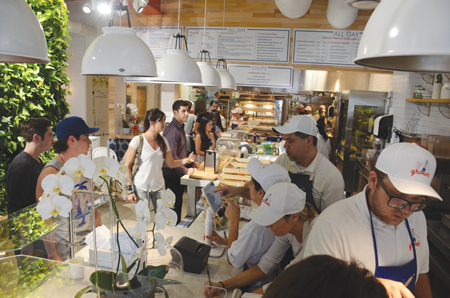 Everything is made fresh and all of their sauces, stocks and soups are made from organic ingredients. Even the mayonnaise is homemade. It takes many hands to prepare and serve fresh organic food in a fast-paced environment, but Grown accomplishes this with a staff of 24 that includes the head chef and several line cooks. “We don’t have a microwave, we don’t have a fryolator, we don’t serve sodas, and there is no peanut anything in our kitchen. We are a food allergy safe zone,” said Shannon. Grown’s casual style promotes relaxation and allows you to spend some time lingering over your food—unusual for a fast food joint. The menu has Paleo, vegan and gluten-free options. Prices range from $4 to $18. Breakfast fare includes egg-white omelets, fresh fruit, cold-pressed juices, organic frozen smoothies, coffee, and bakery treats. Soups, salads, sandwiches, and wraps abound. Organic free-range rotisserie chicken, grass-fed beef, and fish served with side dishes are available. Fruit-infused plain and carbonated waters are available at the all-you-can-drink “hydration station.” And if your schedule won’t allow a quick trip to Grown, you can order food delivered to your door via the Postmates app. Parents to five children, the Allen’s lead extremely busy lives. Walter Ray Allen, Jr. played NBA basketball from 1996 to 2014 for the Milwaukee Bucks, Seattle SuperSonics, Boston Celtics and Miami Heat. A graduate of the University of Connecticut, he leads the NBA in career three-point field goals in regular and postseason games. He is a ten-time NBA All-Star, Olympic gold medal winner, and has acted in films and commercials. Ray established the Ray of Hope Foundation in 1997 to assist with sports-related and community-based programs for youth. The foundation provides avenues of opportunity through which youth can “hope” to realize their full potential by fostering a mix of scholarship, culture and imagination that can help to change the world. Shannon Allen is a singer, songwriter, actress, and television producer. Shannon was a singer in the 1990s girl group known as “Shades.” She took her talents as a home chef who made healthy, organic meals for her husband and children to her television show “Pre-Game Meal” for Comcast Sportsnet when Ray was playing for the Boston Celtics. The popular show featured sports stars preparing healthy food with Shannon. Ray and Shannon’s son Walker was diagnosed with Type 1 diabetes when he was 17 months old. A serious disease, Walker’s condition requires careful management of his diet, timed insulin injections, carbohydrate counting, and monitoring of his blood sugar levels. Diabetics must eat on schedule. One day in Boston, Shannon was on her way to the grocery store when she realized Walker needed to eat immediately. Her search to find food appropriate for him to eat met with failure, so she called her friend chef Todd Kiley and he prepared gluten-free panko-crusted chicken tenders and unsweetened iced tea for a hefty price. Shannon’s frustration with the lack of nutrition and flavor in fast food got her and Ray discussing the idea for Grown. For six years they conceptualized, planned and put together a great team for the family enterprise. Chef Todd of the Rainforest Café and Legendary Restaurant Group relocated from Boston to Miami to become Grown’s executive chef. He advises on menu items and is helping Grown become one of the rare establishments in the country to earn Organic Certification. The Allens are proud of their accomplishments with Grown. They have created an organic food drive-through, they support local organic farmers, they hire good people in need of jobs, and they serve a diverse clientele. “We feel very fortunate about the response from the Miami community, their overwhelming support. With Grown, we realized that no one was going to do this. So, if there is one thing I want to say it is that the world is waiting for your idea. Do it now,” said Shannon. Grown’s 1,900 square-foot space will eventually include an urban rooftop garden to help supply fresh fruits and vegetables for the restaurant. Open seven days a week from 8 a.m. to 9 p.m., the eatery is located at 8211 South Dixie Highway. For more information, call 305-663-GROW (4769) or visit at www.grown.org.